Chicago People's Thanksgiving rejects Rahm, demands a people's agenda | Fight Back! Maria Hernandez and Ariel Atkins of Black Lives Matter-Chicago receive the Angela Davis Award from Freedom Road Socialist Organization in Chicago. 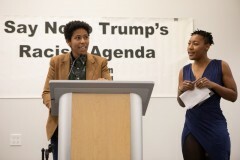 Maria Hernandez and Ariel Atkins of Black Lives Matter-Chicago receive an award. Chicago, IL - A room of 150 trade unionists and activists from the Black, Arab, Filipino and Latino communities cheered, chanted and sang at the 27th People’s Thanksgiving in Chicago, December 1. Sponsored by Freedom Road Socialist Organization, raising funds for the newspaper Fight Back!, the theme of the event was, “Ending Rahm’s Racist Agenda, Fighting for the People’s Agenda.” Awards were given to groups that represented important movements challenging the mayor and his buddies in the 1%. Prominent among the honored guests was the Chicago Teachers Union - Alliance of Charter Teachers and Staff, who are preparing for the first in the country strike on December 4. Chris Baehrend, chair of CTU-ACTS, said, “Here we are on the front lines, organizing teachers and parents to fight for the justice that our students deserve.” The union was presented with an award named for Lucy Gonzalez Parsons, a trade union leader from Chicago’s history that was uncompromising in defending the families and children of the working class. The Campaign to TAKE ON HATE, with several tables filled mainly with young Arabs from Chicago’s southwest suburbs, who have engaged in a yearlong fight against Islamophobia in the racist Republican-dominated Palos Township. Their award was named for their hero, Rasmea Odeh, the Palestinian community organizer in Chicago who was deported by the U.S. government last year. Aislinn Pulley of Black Lives Matter presented the Angela Davis award to two of her sister activists, Ariel Atkins and Maria Hernandez. She honored their leadership in the fight to stop a new police academy from being built on Chicago’s West Side. She also announced that the main demand of the movement is for community control of the police, through the elected, civilian police accountability council (CPAC). The crisis of police accountability and the community fights against austerity resulted in Mayor Emanuel dropping out of his reelection bid. Chapman revealed that over 200 candidates are in the running for the 50 council seats, especially those representing the communities of Blacks and Latinos.